One of the first heralds of spring is the radish – its bright green tops give way to radiant red when pulled from the soil. An easy veggie to grow, these plants can be started from seed as early as March. They thrive in cool climates, and can even be grown indoors in containers as long as they are placed in strong sunlight. Quick to sprout, and maturing in roughly three weeks, they are a satisfying crop for beginning gardeners and a fun project for kids, too.Radishes have been cultivated for thousands of years around the world. A derivative of the mustard family, these root vegetables are a staple in the cuisines of Asia, the mid-east, Europe and the Americas. The bright red Cherry Belle variety is most common in this country, used as a salad ingredient, crudit component, or stir fry addition. Jeremy Kittleson, executive chef at Restaurant Avondale, considers radishes a basic for any kitchen. 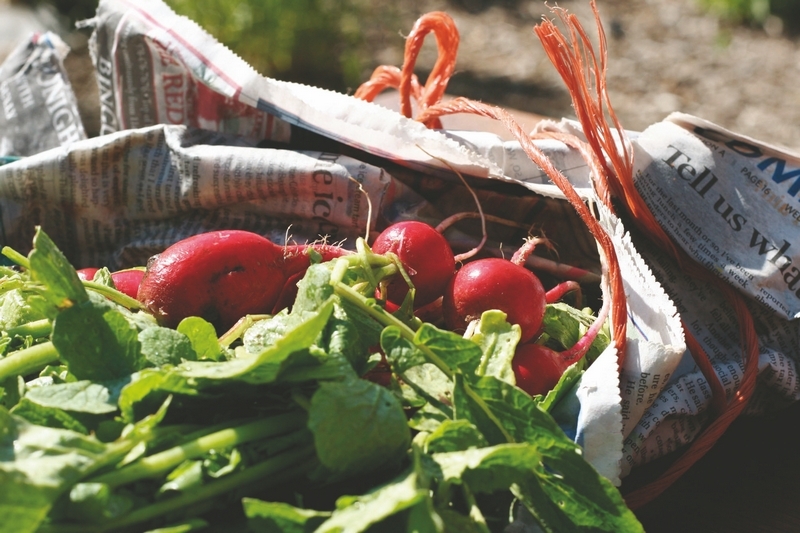 “As a tasty alternative to the crunch of raw radish, try one of these recipes as a side dish. Cooking radishes, brings out a sweetness to balance their spice. The color turns a soft rosy pink, a beautiful addition to the plate.”Nutritionally charged, the radish is a key component for healthy eating or a weight loss diet. Rich in fiber and Vitamin C, it has no saturated fat or cholesterol. Its spicy, crisp, crunchiness makes a great snack to ward off cravings. Welcoming spring has never been easier. 1 pound red radishes, trimmed, cut into 1/4-inch thick slices1/2 lemon, zest and juice only 1/2 orange, zest and juice only2 Tablespoons sugar1 Tablespoon buttersalt and freshly ground black pepperwater, to coverPlace all the ingredients into a wide shallow pan along with enough water to almost cover the ingredients. Bring to a boil, then reduce the heat and simmer gently for about 30 minutes, stirring from time to time, until all the liquid has reduced down to a few tablespoons of rich buttery syrup and the radishes are very tender. Serve warm to accompany charcuterie, fish or lamb. 1 1/2 pounds red radishes, ends trimmed2 Tablespoons butter2 Tablespoons sugar1 Tablespoon distilled white vinegarCoarse salt and ground pepperCut large radishes in half; leave small ones whole. In a 12-inch skillet, combine radishes, butter, sugar, vinegar, 1 teaspoon salt, 1/4 teaspoon pepper, and 1 1/2 cups water. Bring to a boil over high heat; cook, stirring occasionally, until liquid has reduced and radishes are tender and glazed, 10 to 15 minutes. Serves 4. A delicious accompaniment to grilled meats.Visit this story online at http://www.vaildaily.com for a recipe for LaVenture Farm’s radish crostini. Sweet Butter:1 cup high quality softened butter1/2 cup mascarpone cheese1/2 cup chevre1/2 teaspoon kosher saltAllow ingredients to come to room temperature. In a mixer or food processor, combine all the ingredients and blend until smooth. Reserve.Pumpernickel croutons:4 slices of pumpernickel bread1 tablespoon of extra virgin olive oilPre-heat the oven to 350˚F. Remove the crust from the bread and cut diagonally into triangle-shaped quarters. Lightly rub the croutons with extra virgin olive oil and put onto a sheet pan. Toast the bread in the oven for about 5 minutes or until the bread is crisp on the outside but still soft in the middle.Sliced radish:4 radishes, different varieties if available1 tablespoon fresh tarragon leaves1 tablespoon rocket (arugula)1 tablespoon extra virgin olive oilSalt and pepperGarnish: Kilauea Black Sea SaltSlice the radishes very thin using a mandolin. In a small mixing bowl, combine the radishes, tarragon, rocket and extra virgin olive oil. Season lightly with salt and pepper. Gently mix.Assembly: Spread each crostini with about one teaspoon of the sweet butter. Place some of the radish mixture on top of the crostinis. Garnish with a small pinch of Kilauea Black Sea Salt and serve immediately. Serves 4.Sue Barham is the marketing director for Larkspur Restaurant and Restaurant Avondale. Larkspur (www.larkspurvail.com), at the base of Vail Mountain, has been serving American classics with a fresh interpretation since 1999. Avondale (www.avondalerestaurant.com) opened in September 2008 in the Westin Riverfront Resort & Spa and features a West Coast-inspired, market-driven menu. sue@savorygroup.com.